Well this isn’t going to be a long post (good news for you, huh?). But I just wanted to show you my finished black jeans. As you probably know, I have been watching Angela Wolf’s Craftsy course, Sewing Designer Jeans, and Sandra Betzina’s Craftsy course, Pant Fitting Techniques. I used Sandra Betzina’s Vogue pattern V2948 with some modifications posted about here, here, and here. I have finished attaching the curved waistband, attaching the belt carriers (loops) at the same time, and have done more topstitching. As usual, my spool of topstitching thread ran out before the garment was finished! Luckily, this time, I did have white topstitching thread at home! I decided to understitch my waistband and hand sew my pocket linings to the centre front seams of my pants to make sure they always stay in place when I put my hand in and pull it out. One thing I did not like was the quality of the Jeans Buttons I purchased. At first I couldn’t push the posts on hard enough to break through the fabric, then when I did manage to hammer it through, it bent the bottom fastener and now I am not sure my button will stay attached. Maybe it will last? I am going to practice attaching Jeans Buttons some more with my scrap fabric, just in case it was me, but in the meantime I won’t be putting on any more Jeans Buttons, or Rivets, on what I sew until I get this straightened out. Another thing, with this black pair of jeans, I found the black denim to be too light weight to be a proper pair of jeans, so I cut 8 inches off the legs and turned them into Capris for the summer! A happy solution! 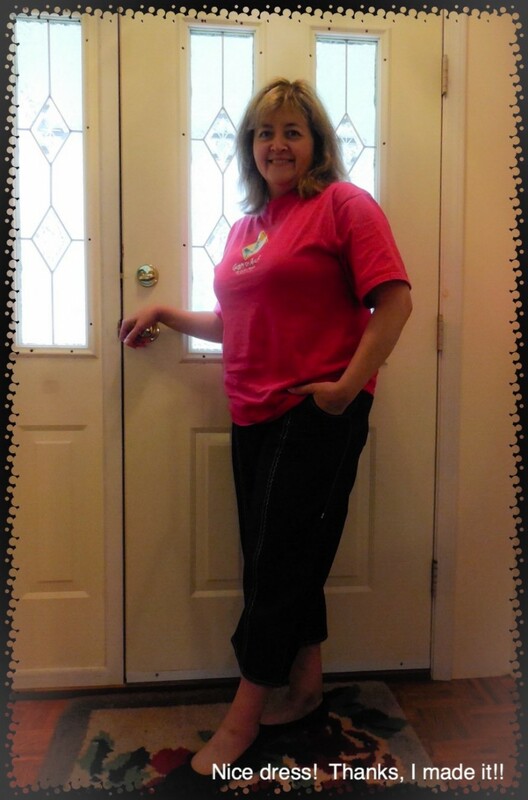 Me in my new black denim Capris! This is me getting ready to step out into the sunshine for a lovely walk on the beach. Not happening! I might be dressed for a sunny walk, but its RAINING out there! Back to my sewing, I am almost finished my blue pair. I’ll post about them when I am finished. I am still determined to make a black pair of jeans too, so I am on the look out for proper cotton lycra fabric! I love the pockets and the belt loops, a lot of detail and straight stitching. The Capri jeans look good on you. Way to go. Where’s Simon or Sophie? I make Capris Jeans and you are looking for cats? ha ha ha… I had Simon in a few shots. Every single one of them turned out with me grimacing and a grey ball of fluff flying out of my arms! Yes the fabric is too light for winter. Thanks! These look great on you! I really like the contrasting facing fabric and the topstitching is so neat! I use a bradawl to poke the hole into the fabric first to fit jeans buttons and find that helps me. Your Capri pants are definitely summer ready! Woo hoo, they look great, fabulous top stitching! Great idea to chop down into capri pants. 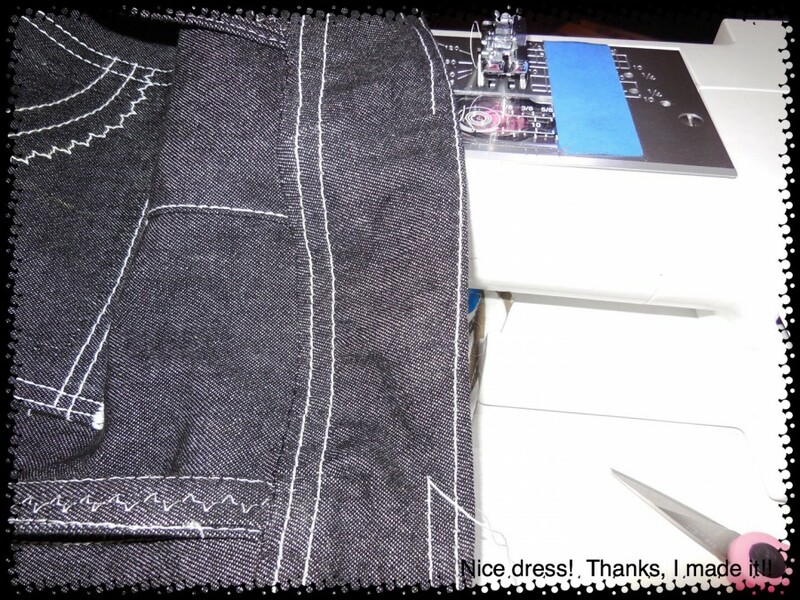 With the jeans I’m working on I didn’t have a problem with the button, I think they are the Hemline ones. I did have a problem with rivets which sent my stress levels shooting up. I gave up with the ones I bought on eBay and have now ordered some from the US as they have had great reviews. Being in the UK I needed to spend over $25 so I ordered 100 rivets and 10 buttons. The buttons are all metal rather. This is the article I found the source for the rivets on. Thanks for the tips. Everything else went so well, it would be nice to get the rivets and buttons the best they can be too! Love the “jeans”. I always make a hole in my denim with an awl before putting the button shank through and never have a problem with attaching the button. Thanks! I was thinking there must be a better way! Linda these look great! I love the princess seams in these jeans!! So clever to combine courses 🙂 I also had a hard time with hammering the button onto the shank. You have to hit it dead on or the shank will bend. Thank you for the compliments and the tips! I am going to practice a bit with scraps before I put on anymore. But I will “get it”! Looking pretty swanky there girl. Just to let you know I was looking at designer jean the other day and not only are they expensive but they don’t have half the “designer” look that yours do. But then I was only looking at the $55.00 pair, the $105.00 pair, well not in my budget. Yours look great. Thanks! Ya $105 was never in my budget, especially when they are probably mass produced somewhere for 10 cents a day? And then, would they fit me? Great fit, great style and great sewing. Well done Linda. Thank you! Now I just need a sunny day to wear them! They look fantastic! It’s a shame the weather wasn’t cooperating but it must be lovely to be able to wear them out and about after the time and care you took with them. Thank you! Like with everything (cooking, crafts, etc.) if you do it yourself, handmade, from scratch, it is even more special! 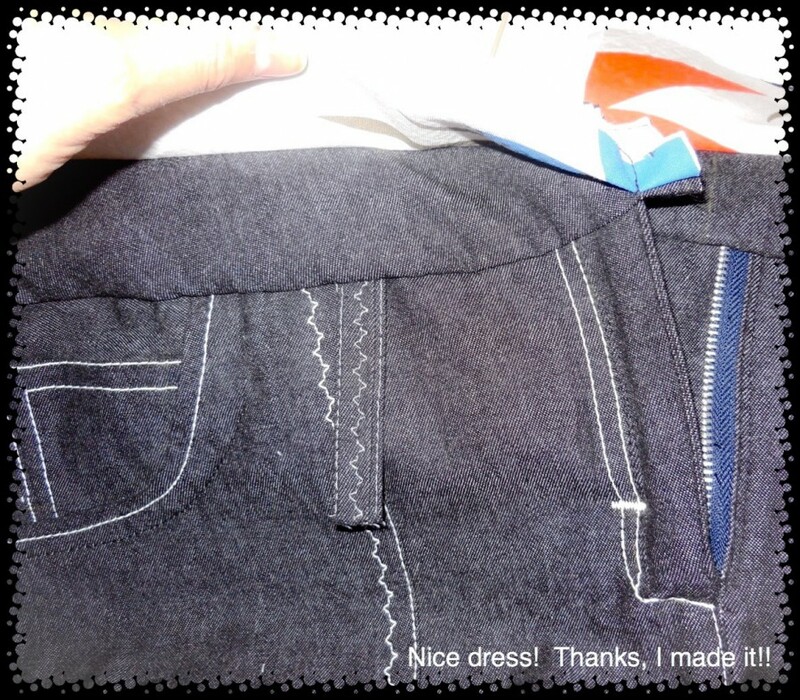 Looks like those Craftsy classes are very helpful – your jeans look gorgeous and the topstitching is very neat. So far I have only used sew on metal buttons for my jeans, I’m afraid of all that hardware, but I did use hammer on snaps on a project once. Thank you! On this lighter denim, I might have to go back to a sew on button. 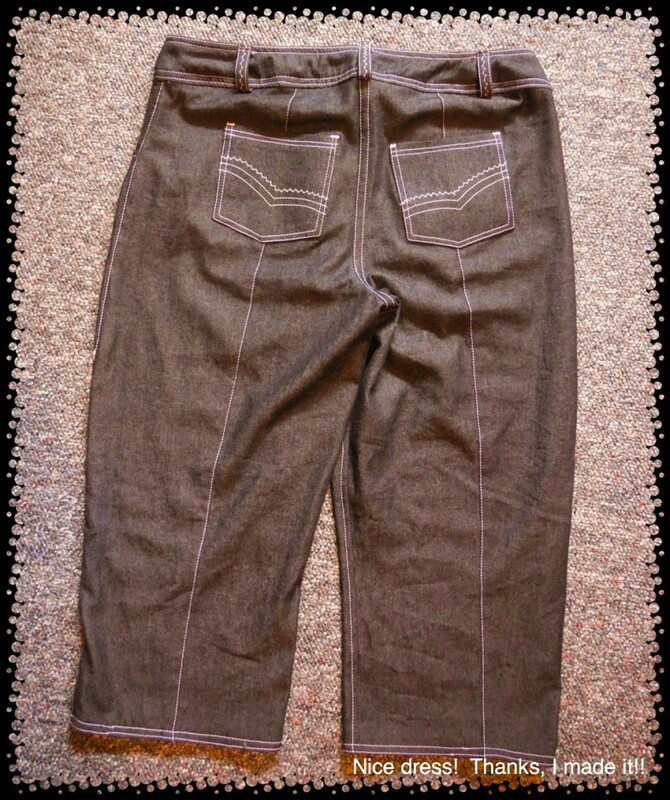 My second pair i am making is heavier though, so I might be safe using a proper jeans button and a hammer! 🙂 I am determined! I’ve gotten some tips from other bloggers so…. 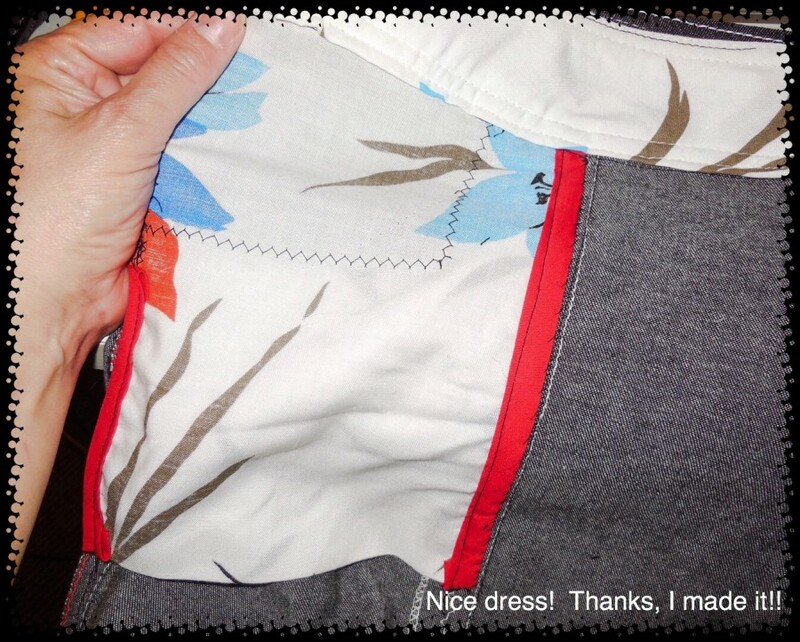 Thank you for hosting Sew It Chic! They look so good! I have a question – did you use a different kind of thread for the topstitching? Also, the topstiching looks great and really original. I can’t wait to see the blue pair. Thanks for the compliments! Yes, I purchased thread specifically called “topstitching” thread. It is thicker and therefore you need size 14 or 16 needles, with a bigger hole. 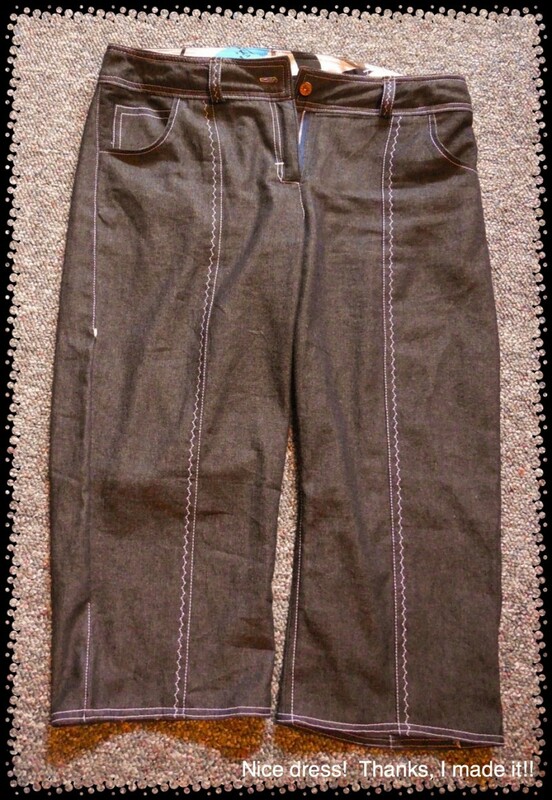 But I bought “topstitching” sewing needles too and used those for these jeans. I also bought “denim” needles but I didn’t see much difference between the topstitching and the denim needles, maybe my denim wasn’t THAT heavyweight. I have heard that you can use two spools of regular thread for topstitching, to save you having to buy something new. But I haven’t tried that myself.